About The Artist: Sponsored by WBUG, a radio station that only insects can hear, The Wee Hairy Beasties’ first concert was at the Brookfield Zoo in Chicago. The band was under the mistaken impression they would be playing to the animals, so all their songs were about animals. The children that showed up seemed to enjoy the show a great deal as well, so a CD was concocted. The resulting Beastie music on Animal Crackers is mostly for kids, but if used wisely, shouldn’t bug the adults either. 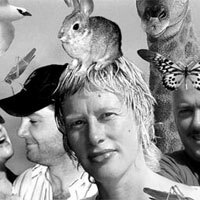 The Beasties, Cyril the Karaoke Squirrel (Jon Langford—Mekons, Waco Brothers, Pine Valley Cosmonauts), Marjorie the Singing Bee (Kelly Hogan), Monkey Double Dippey (Sally Timms-Mekons) and Devil In A Woodpile believe that Kids music need not be unlistenable. Their dance-with-ants-in-your-pants blend of back porch blues, hoppity country and wiggly old timey swing is bound to please any animal, child or adult within earshot.